In autumn, it is not only the colours that catch the eye, but also the different sizes and shapes of leaves. But what makes leaves of different plants differ so much in their shapes? Scientists at the Max Planck Institute for Plant Breeding Research in Cologne have now discovered how a protein called LMI1 can control leaf growth and shape. Francesco Vuolo and colleagues from the laboratory of Max Planck Director Miltos Tsiantis are investigating the mechanisms underlying the dazzling variation in leaf shapes one can see in nature. Recently, they have turned their efforts to investigating little understood leaf parts called stipules. These outgrowths form at the base of a leaf during development and vary greatly in size and function in different plant species. In the model plant Arabidopsis, the mature stipules remain tiny, although they make up a substantial part of the young leaf. In other plants, such as garden pea, the stipules form a large part of the leaf. Using a combination of genetics, microscopy and mathematical models, they were able to show that LMI1 keeps the stipules small. 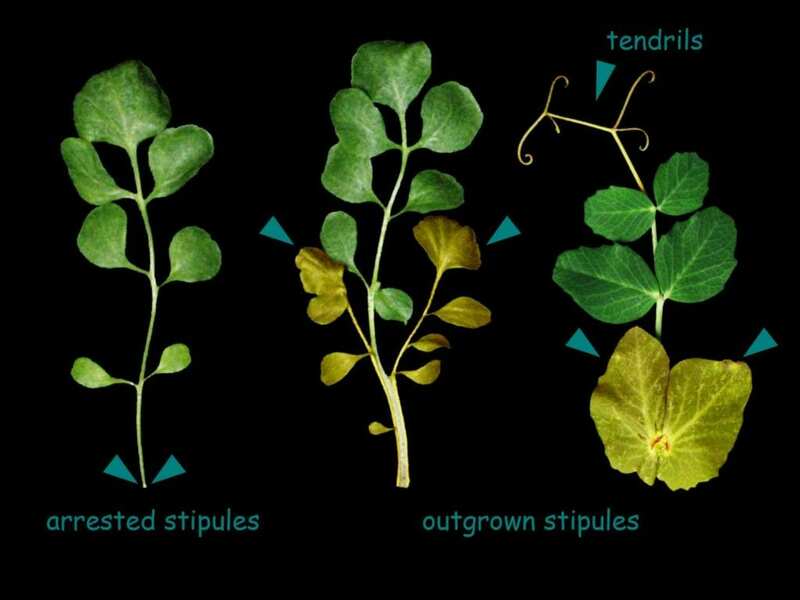 If the protein is produced in a cell during leaf development, it simply continues to grow instead of dividing. This form of cell maturation prevents the cell from developing into other cell types and limits the pool of cells available for further tissue growth. This, in turn, reduces the size of the final organ despite the early increase in cell growth. "The leaf remains smaller despite the larger cells," explains Vuolo. LMI1 also plays a decisive role in the regulation of leaf morphology in other plants. The research team discovered that LMI1 is not produced in the large leaf-like stipule of pea plants, but instead in the upper part of the pea leaf, where thread-like climbing organs called tendrils form. "The cells in the tendrils also grow larger and divide less," said Vuolo. The pattern of LMI1 production in the pea leaf is therefore probably responsible for its characteristic shape, with thread-like tendrils at the tip of the leaf and large stipules at the base. These important findings shed new light on the developmental origin of stipules, suggesting that they are in fact cryptic leaves that are maintained in a repressed state by LMI1. Such problems of how different plant parts like stipules, leaves and tendrils relate to each other already occupied the British natural scientist Charles Darwin who wrote about them in 1865. This study, therefore, solves both long-standing questions of plant morphology as well as new ways of investigating the role of growth in the evolution of leaf shape. "One day, they could contribute to the breeding of new plant varieties for agriculture with modified leaves or other organs. For example we are now investigating the role of the LMI1 protein in growth of the tomato fruit as an important agricultural trait," said Tsiantis, Director at the Max Planck Institute for Plant Breeding Research. LMI1 homeodomain protein regulates organ proportions by spatial modulation of Endoreduplication.